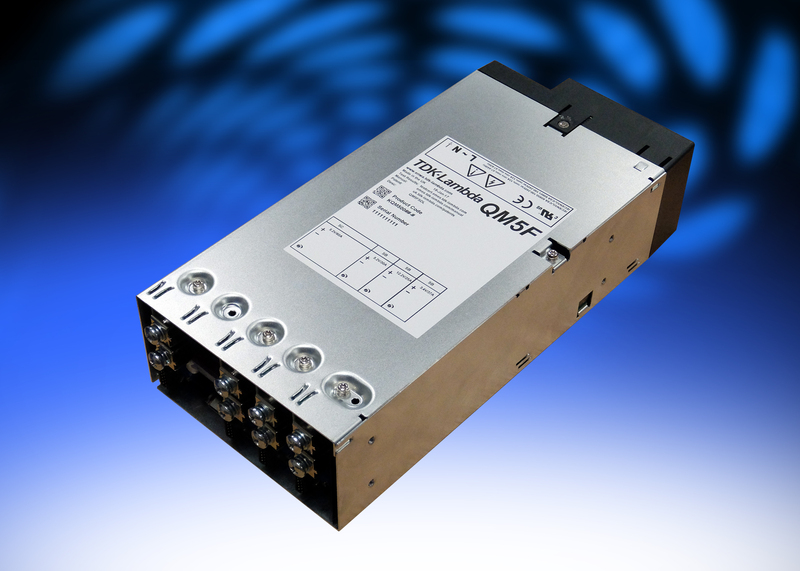 TDK Corporation announces the introduction of 700 to 1200 Watt models to the QM series of modular AC-DC power supplies, featuring low acoustic noise and BF ready isolation. With both medical and industrial safety certifications, the series is suitable for a wide range of applications, including BF rated medical equipment, test and measurement, broadcast, communications and renewable energy applications. Packaged in a 127mm wide, 63.3mm high, 270mm long enclosure, these new QM models can deliver 1200W at 180-264Vac and 700W with a wide range input of 90-264Vac. Up to 12 outputs can be configured using single and dual output modules with voltages from 2.8V to 61.6V. An optional standby/signal module can be selected with a choice of one or two standby voltages (5V, up to 2A and 12V at 1A), unit inhibit or unit enable, an AC Good signal and a PMBus interface. The units will operate in ambient temperatures of -20 to +70°C, derating the output power and output current by 2.5% per °C above 50°C. The QM operating efficiency is up to 91% and as internal power loss is reduced, a low speed low audible noise fan can be utilised. This provides an enhanced patient/user experience and increased reliability as less dirt and contaminants are drawn into the power supply. The QM series is covered by a seven-year warranty. The units are certified to IEC/EN/UL/CSA 60601-1, ANSI/AAMI ES 60601-1, IEC/EN/UL/CSA 60950-1, is designed to meet IEC/EN 61010-1 and has the CE marking for the Low Voltage and RoHS2 Directives. With an input to output isolation of 4,000Vac (2 x MOPPs), 1,500Vac input to ground (1 x MOPP) and 1,500Vac (1 x MOPP) output to ground, the series can be used in BF rated medical equipment. The QM series has a maximum earth leakage current of 300µA, while still complying with the EN61000-6-3:2007 and EN60601-1-2:2015 (curve B conducted and radiated) emission standards. The units also meet the EN60601-1-2 and EN61000-6-2 immunity standards. Product selection is optimised and simplified through the use of an on-line configurator, with a choice of output, signals, leakage currents and standby voltages. Once the desired selection has been made, the configurator will automatically produce a short 7-digit code for easy order placement.